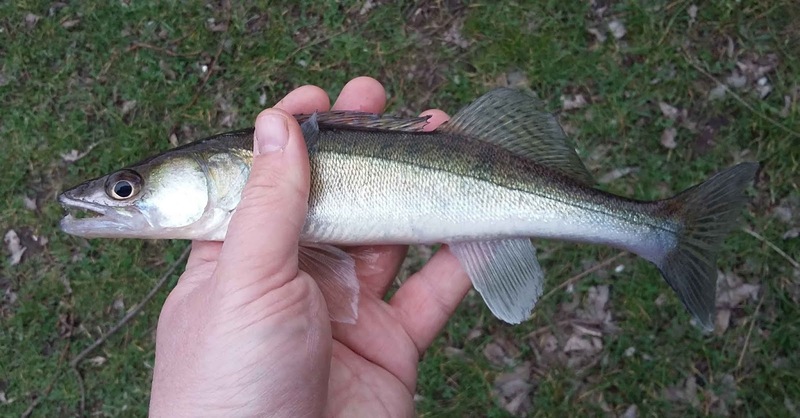 I am not big on making excuses for not catching, but even I have to admit that the lure fishing round these parts is total rubbish at the moment. The pike I am sure have spawned by now, but both the perch and zander seem too have ended up in some kind of limbo due to the temperature first increasing and then dropping again. Literally, I have caught perch that haven't spawned and seen ribbons of eggs clinging to snags. 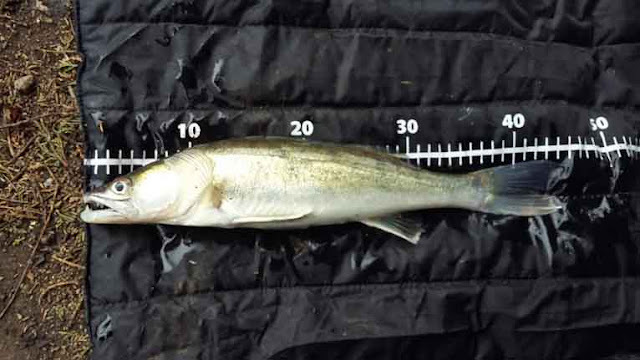 Some zander to are being caught off nests whilst others are still bulging with spawn. I had hoped that after a week away at tropical Burnham-on-Sea I might return to post spawn predators going on the munch but that turned out to be wishful thinking as the low temps and frosty mornings have meant the limbo has persisted even further into April. For my part in this adventure I caught very little apart from several substantial branches, a few poo bags and a little zander of 45cm, which I assume was a little male as it showed no signs of spawn or having spawned. Mind Mick caught only two other smaller ones which gave both us very limited information on whether this area was worth a return visit. I had to wait ages for my next session and when my chance came I nearly wasted it after going out for a curry with some mates and not crawling into bed until two in the morning. 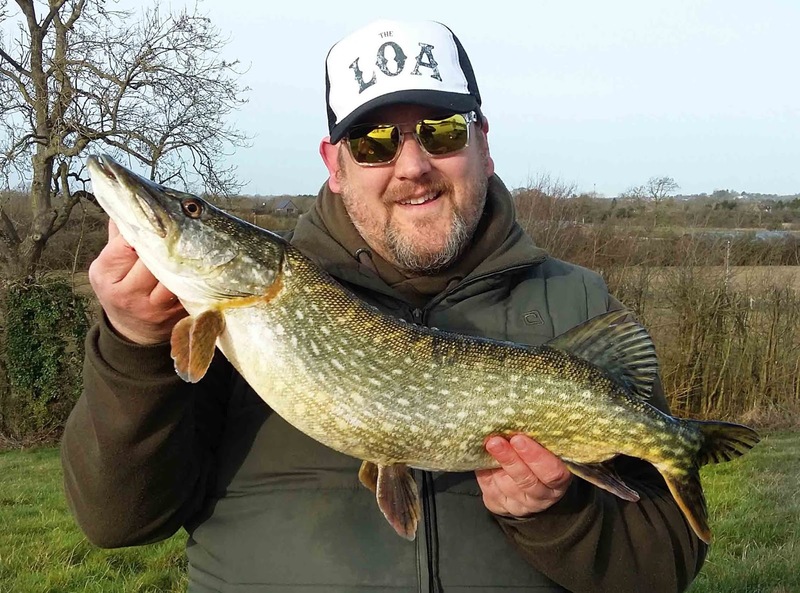 Lucky for me the family were receptive to me re-jigging our plans for the day and chipping off for a short evening session on a shallow water I know is rife with pike. Two ideas came to mind re this trip; firstly I wanted to fish some surface/subsurface lures for the pike, secondly I wanted to have my first go fishing the reverse dropshot rig for the huge perch in this water. 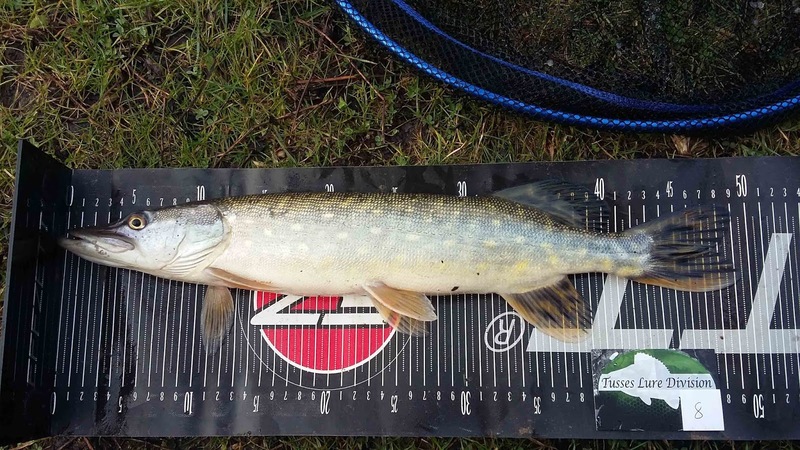 As this water is painfully shallow I was convinced both the perch and pike should have done with spawning by now and that after a few weeks with little rain the water would be gin clear and those pike couldn't fail to detect the noisy top water lures. Casting the Rad about in the perfectly clear water turned out to be some of the most exciting fishing I've done for years. The little pike although out-sized by the lure would repeatedly charge after it as if they were about to attack, before turning off at the last minute once there realized exactly how much of a mouthful the lure was. It wasn't too long before I cracked out the drop shot rod to fish some highly buoyant worm style lures a foot and half off the weedy bottom. 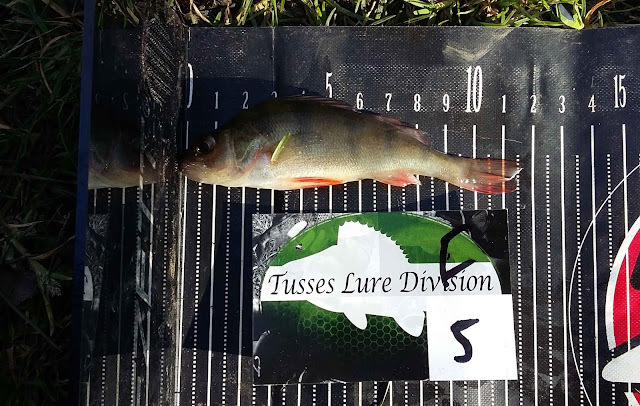 In doing so I quickly found a shoal of small greedy perch were hell bent on eating lures the same length as themselves and bigger. Unfortunately the fuss caused by the writhing perch all too quickly got the attention of the hungry jack pike and after stealing a couple of captures I hooked one of the vicious attackers and on my light dropshot outfit in that shallow water, it sent my reel into meltdown. Lucky for me the hook was right in the corner of the cheeky jacks mouth and smashing up the shallows into a muddy soup I netted the hungry little fellow and grabbed myself one last hazy selfie due to my cracked phone screen. I do hope the canals and all the other stuttering venues come back into form with the approaching warm temperatures, as I have plenty of practising to do for a couple of up and coming matches and I wouldn't mind actually catching a few of those hungry jacks off the top once their blood boils up and they grow even more savage. Practice and Tusses Freestyle league round one. 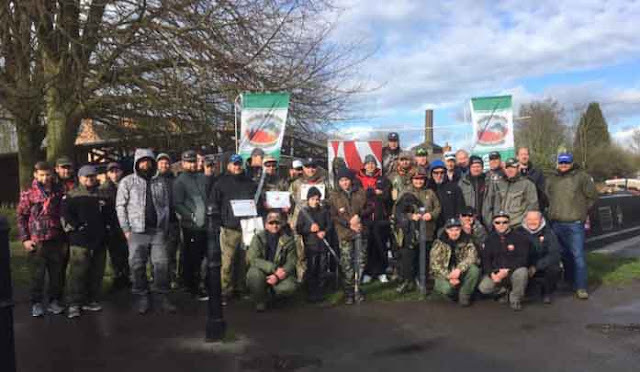 Earlier on in the year when I first heard Tusses Lure Division would be running a league on my local waters I was very keen to take part. 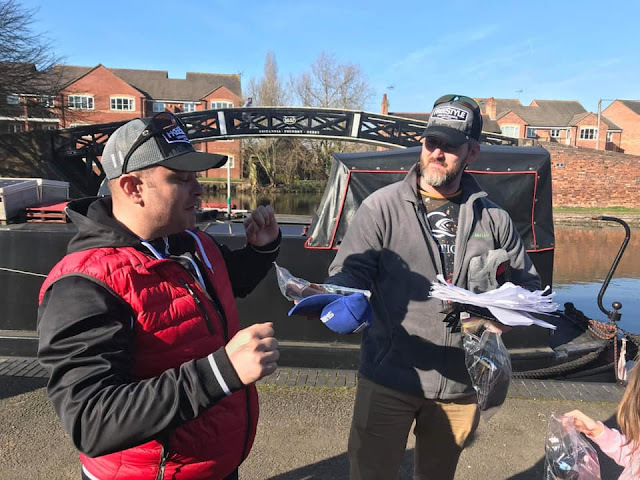 However it wasn't until I started looking at the calender and at the upcoming matches I wanted to fish combined with other fishing targets for the year that I concluded it was going to be too much of a commitment for me to make. But even though I was unable to commit I decided that I would still like to be involved even in a much smaller capacity if possible. So I put it out amongst the people I knew that were fishing that I would be more than happy to be a substitute if anyone needed one. Low and behold it turned out that Greg Bafia from Team Realistic shad was going to miss the first match and his partner, my old friend David Warren, soon asked me to fill in. The basin itself proved rather fruitless for me even though it did look good for a few hits, but it wasn't until I went walkies outside it that I found myself a couple of hungry predators. 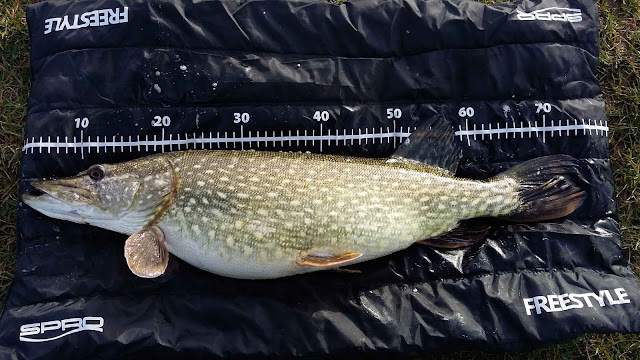 The first was a spawned out young female pike which I found lurking close to the edge and the second was a nice match sized zander which was lingering close to a brick wall. 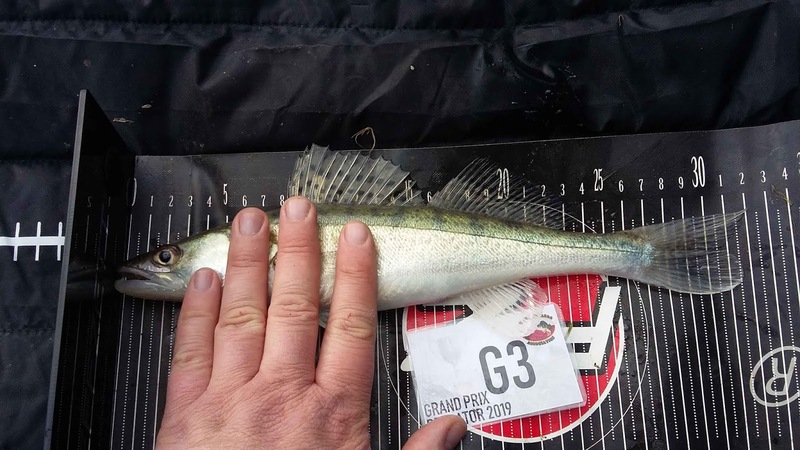 Ninety five centimetres in under and hour was a bit of a shock to be honest, but things would be very different in the match with thirty plus other lure anglers jockeying for position. Tusses Freestyle League round one. The morning of the match the car park on Leicester row near the basin was full of anglers when I arrived. I recognised most of them from various competitions and events and seeing them all, knowing this stretch to be a hard water thought this was going be a beast of an urban competition. Myself and David had already discussed a rough plan and after the complimentary bacon butties were eaten the event began with a staggered start. Even though we had drawn an early number we were the last team off as David was officiating and that meant we were the last ones away. As predicted it was a torridly hard affair and we searched so much water in vain, catching very little for our efforts. 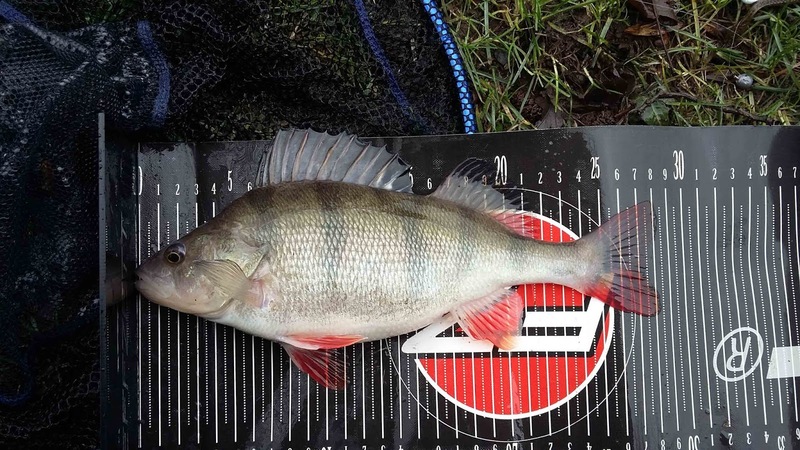 The fish were very cagey all round; the few small perch we winkled out were really on the small side, the bigger ones near impossible to catch as they were still to spawn. My idea to gamble on taking a pike outfit turned out to be a bad decision as the only pike our team encountered came to David's rod, biting him off in an instant and as for my heavy rig, it pulled nothing but large branches out of the canal. 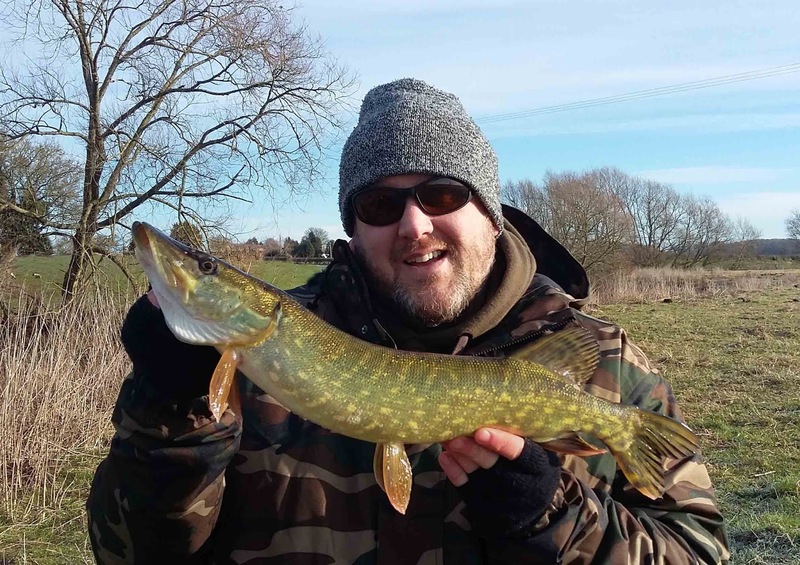 Along with that pike bite off I had one better perch follow my lure right to the surface before turning off and we had handful of very unfruitful nibbles. 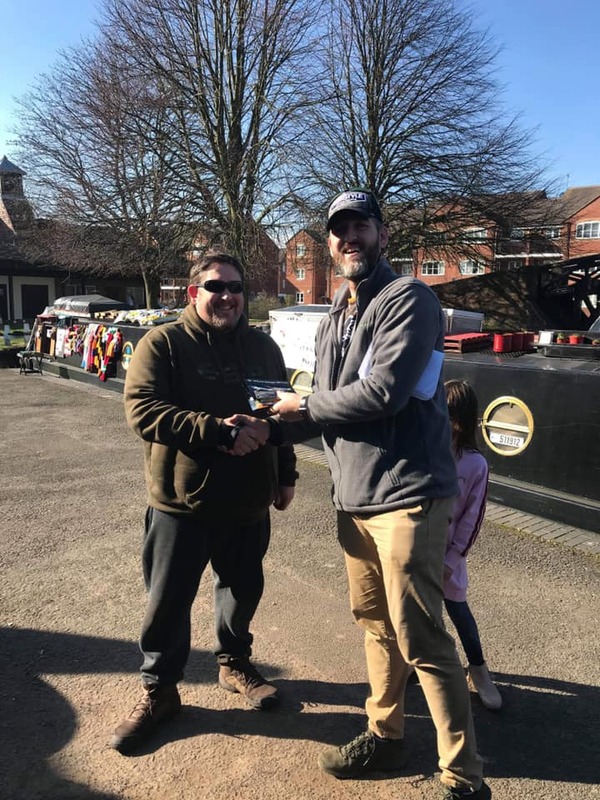 The saviour of our match had to be David's spectacular final capture where he dropped a lure straight onto what was obviously a nesting zander which in a savage act of defence tore into the lure and proceeded to jump out of the water like a tarpon. Once landed it was the most magnificent dark fish you're likely to see. 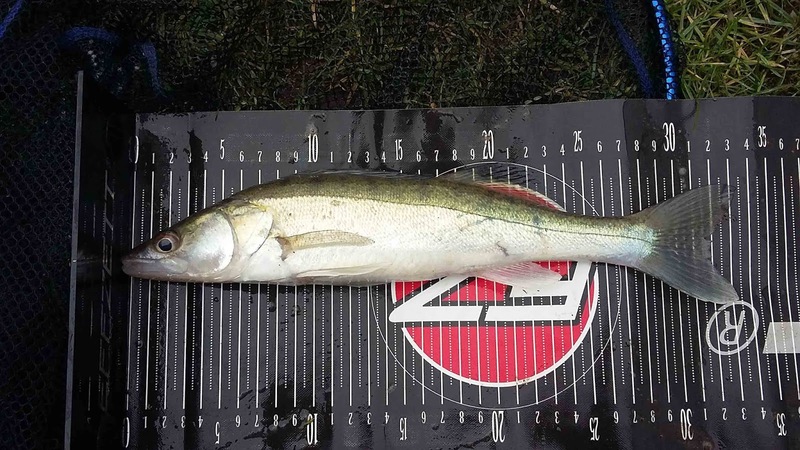 At 44cm this fish was very close to turning the biggest zed prize into a three way tie. Even missing out on that it still served to add vital species points to our score just before the sheets had to be handed in. As for us... we were unlucky to finish in 11th place in this first match just outside the points. Literally one tiny perch could have made the difference for us in this one. Personally I think I made a big mistake in taking along that second rod as I feel it distracted me far too much and should I have levelled that concentration on just fishing the light outfit I feel sure we could have added a couple of valuable fish to the score which may have made quite a difference to Team realistic shad rankings (Sorry David and Greg). However I already may have my opportunity at redemption in the Freestyle league after being recruited straight away to fill in for another team in round two - the all female Lure Witches team. 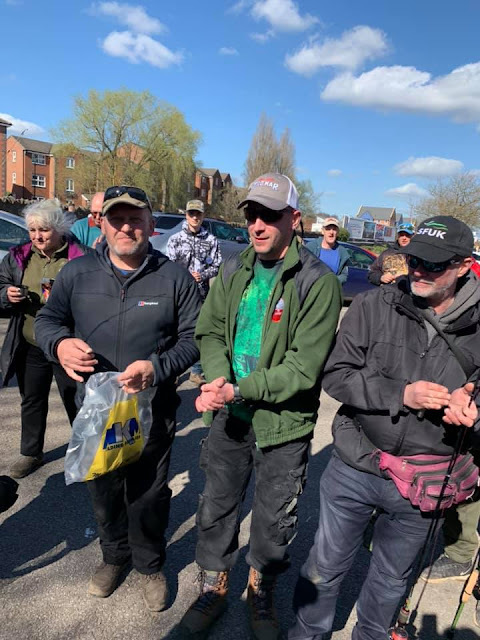 When I arrived into the parking area it was already buzzing with anglers all ready for a day of lure slinging, but from what I could see at first glance I might be the only non-polish competitor in attendance. That was until I spotted Ashley who I'd met a few weeks prior in the Tusses Spro warm up. 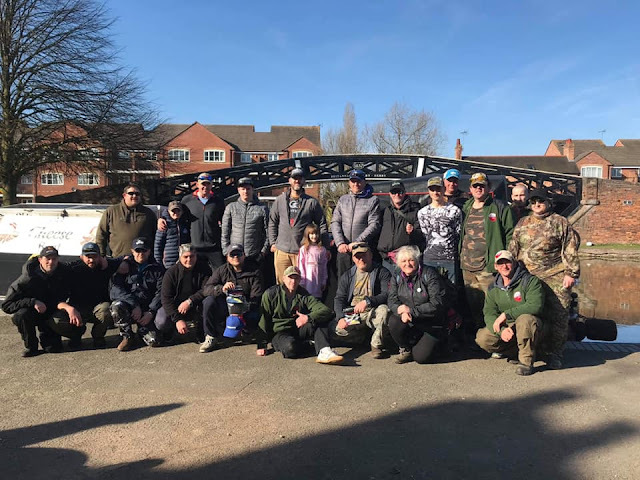 I needn't have been concerned about being one of the few English lads competing as it quickly became very clear that the members from the Polish Anglers Association were a very friendly lot and welcomed us heartily, every one of them shaking hands upon arrival which would be something nice to see at other matches. 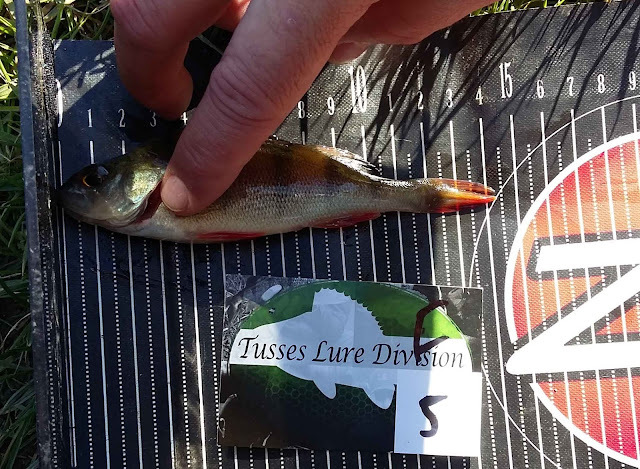 It was also somewhat helpful that we knew Greg Bafia from the Tusses lure division who very helpfully translated any important info through the day. After all the greetings were done and the entrance fee was paid, the chaps in charge began paring us up ready for the off and filling us in on the rules for the match. 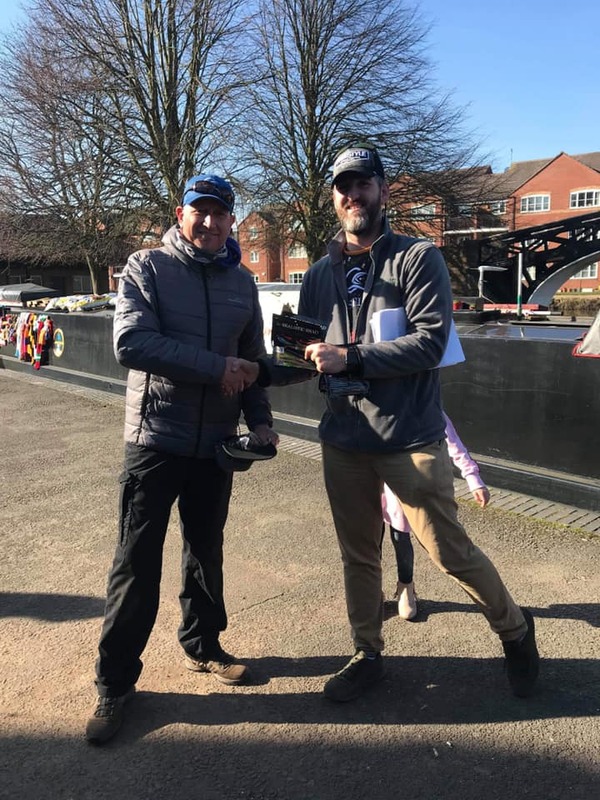 Having had a little wander around the venue a couple of days prior and seeing what a state the canals were in after the ever blowing gales had kept just about every molecule of sediment suspended in the water, I knew the first few hours of this match would be key. 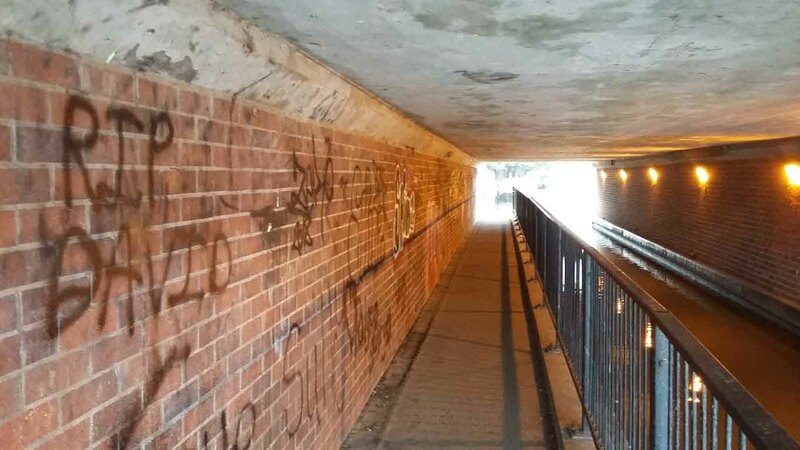 As much as I dislike the Oxford canal it seemed the best option as there was a noticeable colour difference between that and the adjacent Coventry. 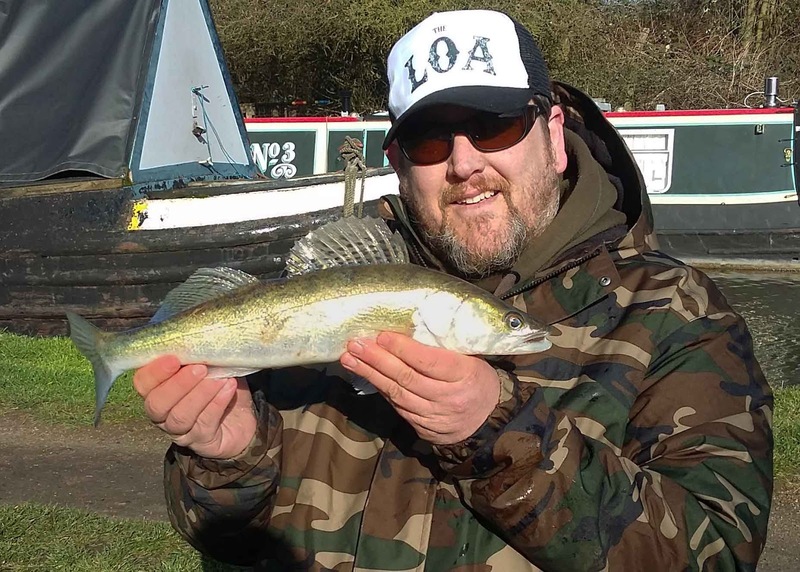 So with my partner in tow I lead us directly onto the Oxford and this turned out to be a great decision for me as early on I hooked and landed a good size zander which not only settled me down quickly but also put me in a great position early on. By now a lot of the competitors who had gone down the Coventry were filtering back up and down onto the Oxford in search of comfort away from the wind and better conditions in general. This meant that most of the water myself and my partner fished would be second hand which was not ideal. Oddly though three or four spots further down the canal I targeted a snaggy narrow area only to quickly get a pluck which soon turned into a second pluck, followed by a proper hit. 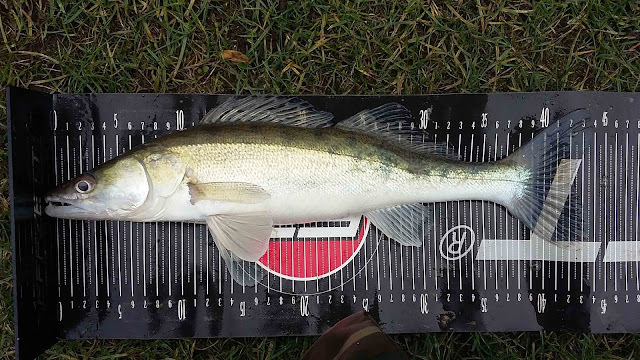 Luckily I had located a shoal of small zander and quickly landed two perfect match sized fish. Much as expected things got worse as the morning wore on. Early on some fantastic fish had been caught including a rumoured 77cm zander, some decent pike and a big perch, but as soon as the first boats began chugging through, the little clarity we had soon disappeared in the clouds of silt churned up. 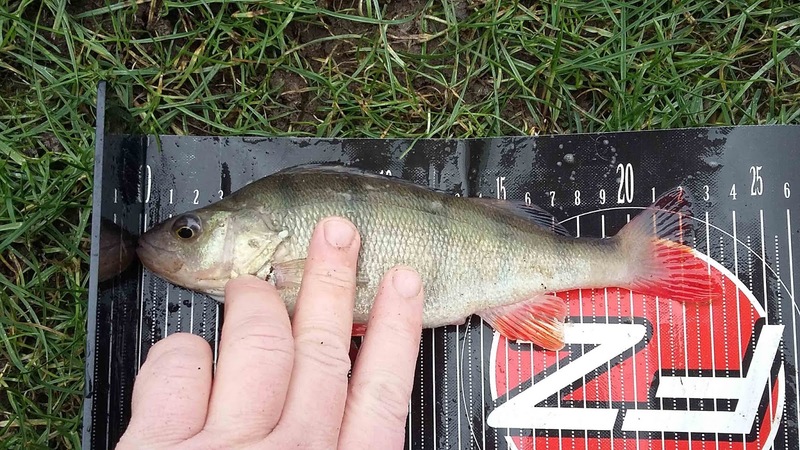 With three zander on my score card I really wanted to try and root out some small perch and so scaled down my lures specifically to target them, focussing on potential holding spots, but the efforts was in vain as the captures all round deteriorated with the weather. In a two hour period the weather changed from sunny and very windy to raining heavily, then snowing. In a break from the weather we marched back to the most productive area where it promptly began hailing hard. Honestly this sudden influx of cold water did nothing to help the already slow fishing in my opinion. After recovering any of the spot where I had found fish, I rolled the dice and dragged my partner off for one last foray onto the abandoned Coventry. It was a real gamble as the wind was hammering down the canal and the water was almost thick, it was that muddy, but if this decision paid off I could have scored some massive perch from one or two haunts I knew. The perch were much as they have been for a while now, conspicuous by their absence! My effort though was rewarded by a single small zed which on a match this hard proved very valuable at 22cm long. It had been a hard match all round from what I could tell but this wasn't evident in the high spirits of all the competitors who were laughing and joking about the awful weather and generally enjoying themselves. On a hard day I was happy with the four fish I had caught, but until the sheets were in and the scores tallied up I would have to wait to see how I had done. It wasn't until one of the officials told me to make sure I stuck around that I realised that I had actually done quite well in these terrible conditions. As the officials spoke away in Polish, Greg translated. Prizes for a previous competition were handed out and the juniors were applauded. Then after a while they got onto the top scores of the day and happily my name came out for the 2nd place position. 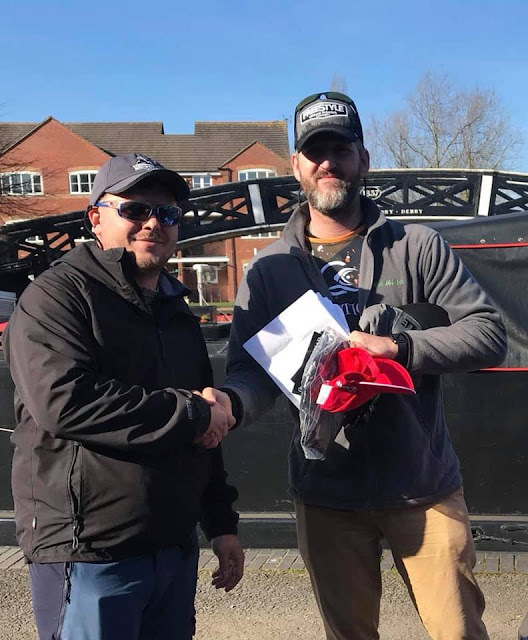 I was made up to finish in the top three as from what I had seen of my fellow competitors they fished really well and their cast rates are unbelievable. 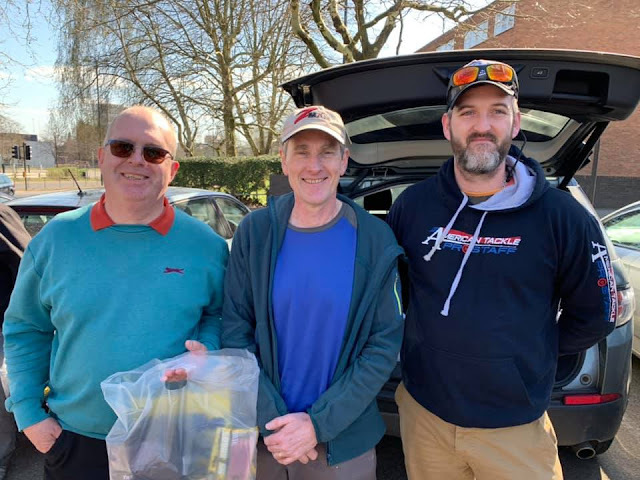 Not only were all the other chaps there great anglers but they made me feel very welcome and they were full of congratulations after the prizes were awarded. 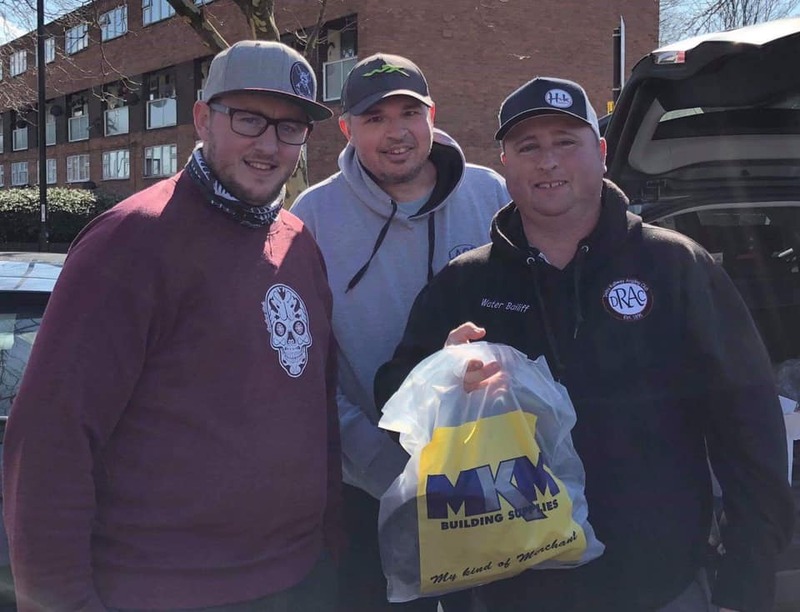 I will certainly not think twice before fishing another PAA event in the future should the opportunity arrive as they really were a great bunch to fish along side. 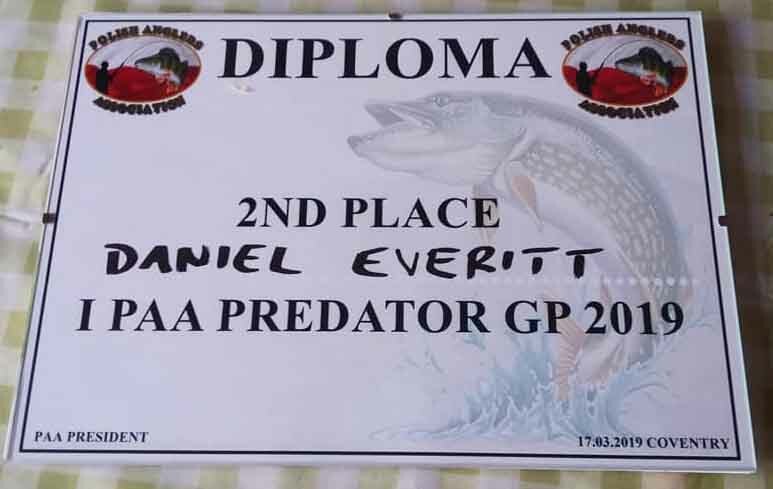 It seems modern society nowadays is obsessed with identity and this categorising has seeped its way into fishing as well. Once upon a time you were simply an angler, now though we all as anglers seem to want to categorise ourselves; carp anglers, predator anglers, match anglers, specimen anglers, barbel anglers, sea angler, lure anglers and pleasure anglers just to name a few. No doubt as you read those descriptions you quite likely would have put yourself into one of the categories as you read it. For my part though I don't see it this way... I see it like this: I think of myself as the centre of a pie chart where the surrounding sections are made up of the previously mentioned types of angler. Dependant on what I am interested in at any one time the specific sections of that pie chart might be bigger. 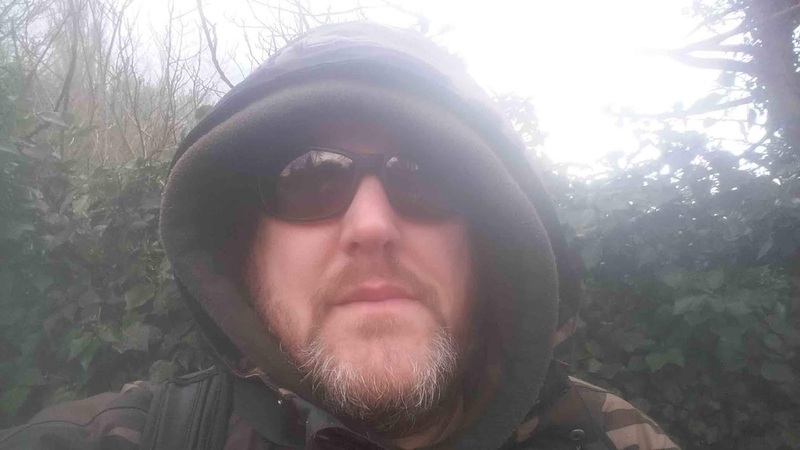 I suppose by description that make me some kind of all rounder, but being an all rounder has its advantages in that by being informed of methods of many facets of angling you can mix and match what your doing to you're advantage! 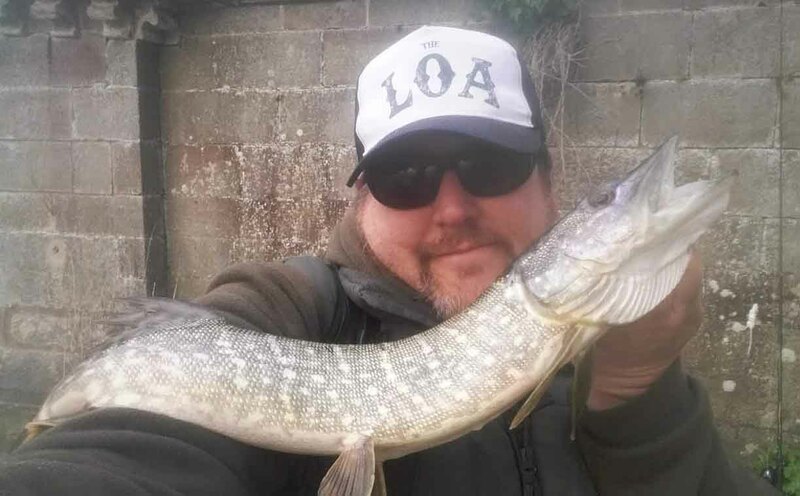 Of late it is not untrue to say that I am leaning more towards lure angling, but its my knowledge as a specimen angler which inspired my most recent outing. 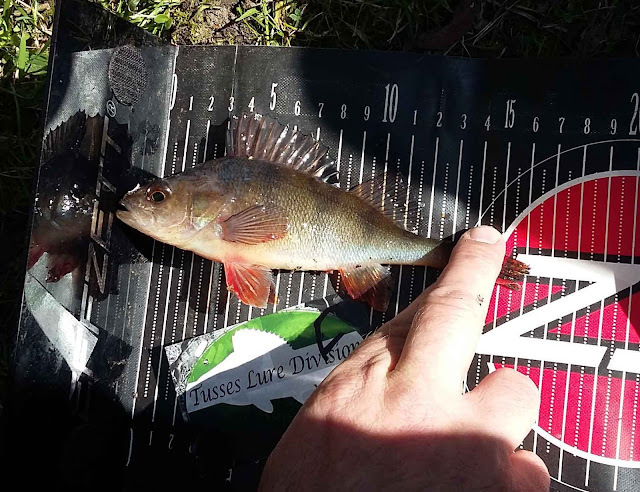 You see I have long theorised that there might be some rather generous sized perch lurking in one of my favourite lakes. 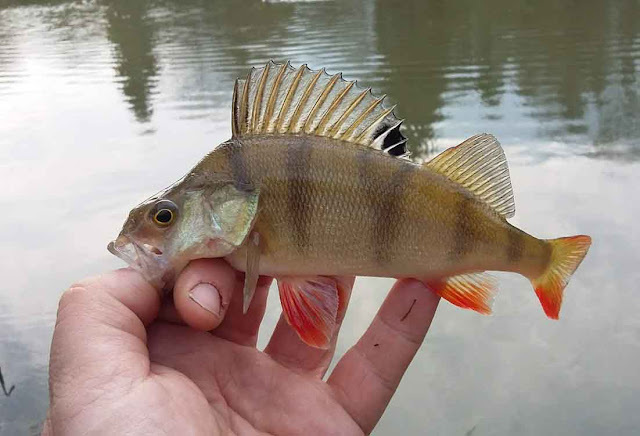 I actually know there is a large population of perch which are generally very focused on tiny baits like caster and maggot. These fish range up to 2lb in weight or 35cm-40cm if you're a lure angler. 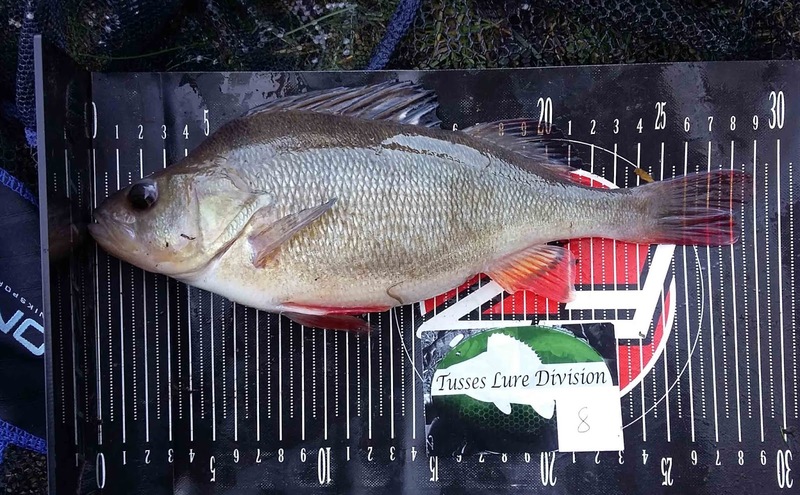 My thoughts though were that there must be a few really big mommas around and that maybe targeting them with lures which the smaller fish really don't respond to until later in the year might help target the big girls specifically. My idea when I arrived early doors was to target some feature strewn spots using crayfish lures fished on Carolina rigs with which I had been having a lot of success lately. I love the way this set up works! 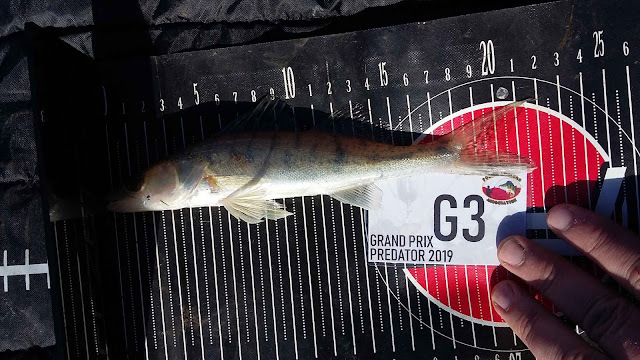 By having the weight of the rig set away from the lure you get these few moments when the weight hits the bottom, the lure is no longer being pulled down by anything and it flutters slowly down - nine times out of ten that's when the perch hit. Being as I was after a specimen and I knew the smaller perch were unlikely to make an appearance I wasn't expecting many fish, but after making hundreds of casts in likely areas I had zero to show for my efforts. That was until I began casting into a reedy bay where I hoped the perch could be gathering ready for spawning. On my first cast I watched the rig hit the bottom and then the sagging braided line shot taught and I struck into thin air. I was sure a fish had grabbed the lure and quickly ejected it. Then three casts later I felt a very distinctive thump resonate up the braided line which again came to naught. The wind was actually blowing a little into the bay and this was helping me to cast onto the reed line and fish a bent retrieve along the edge of the reeds where I thought the fish might been holed up. About three or four twitches along the reeds something smashed the lure hard sending a fizz up from the lake bed as it moved off. 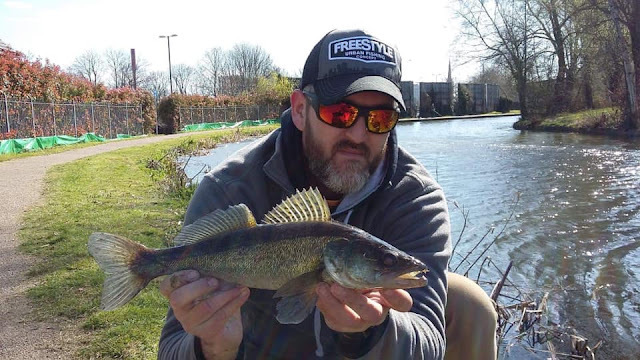 I really thought it could have been a perch at first but the fish just piled on the pressure and powered off sending my little 500 size reel into melt down. 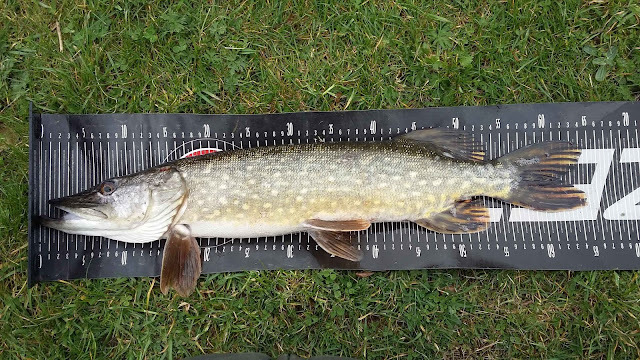 Ten minutes of me retrieving line and it smashing the swim to bits and I got my first sight of a nice looking pike deep down in the clear water. It wasn't until it went into the net that I realised just how much of a pig of a pike it was. She might have been only 75cm long but she was probably 80cm round. Even though she obviously hadn't spawned, she was very much still feeding hard and her stomach was very much laden with fish. Other than her obvious weight issues she was a stunning fish all round and catching her more than made up for the lack of target fish on this outing. I'd been really looking forward to the Tusses warm up friendly for quite a while. These friendly get together club matches have a great vibe about them with anglers of all nationalities that love lure fishing coming together for a good time. 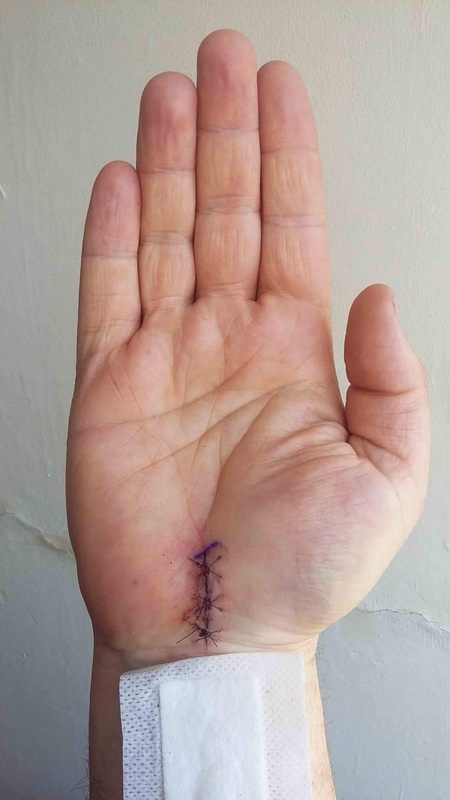 The only fly in my ointment was the fact that nine days prior I'd had some long awaited carpel tunnel surgery on my right hand to cut the transverse carpel ligament and release the pressure on the median nerve. Thus I was left with a stitched up wound at the bottom of my right hand and the ligament that helps the thumbs movement severed. 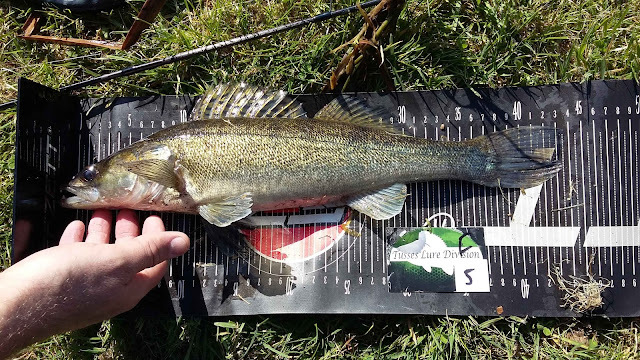 Prior to the event I had a little experiment with a super light lure rod and found that although I was able to fish I couldn't really cast as such. A second experiment with my left hand had me casting like a drunken toddler so I concluded that in the approaching match was going to be strictly limited to fishing under the rod tip dibbling style. 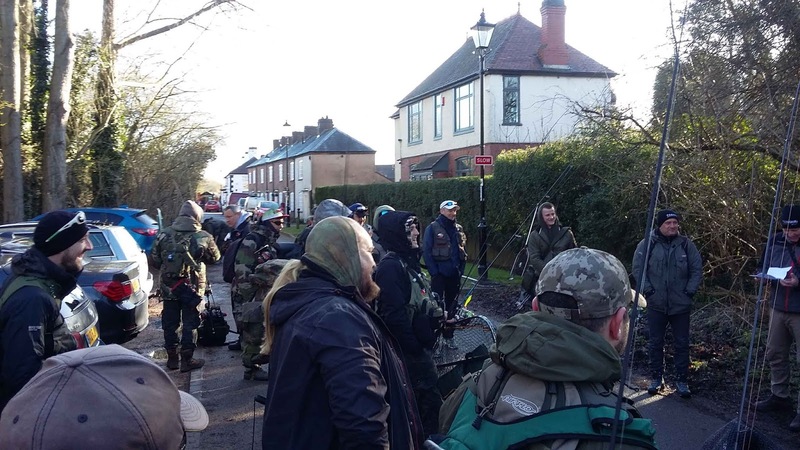 Luckily for me I was green lit to drive by the quack a few days prior to the event and after a wary drive through dense fog I arrived early to see plenty of competitors readying rods in the car park near the Greyhound pub at Hawksbury junction. 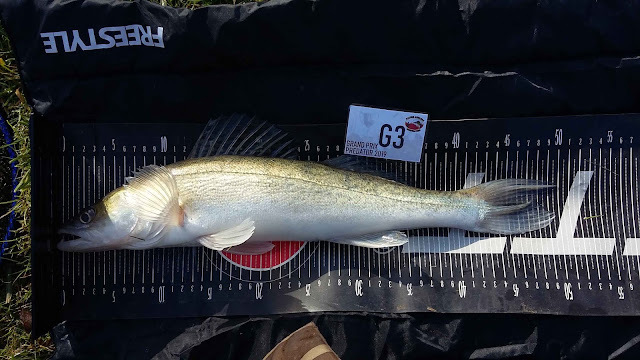 I think everyone had trepidations about the fishing as the recent wall to wall sunshine and high temperatures had probably had little effect on the water temps, so the fish would probably be quite cagey still. This was even worse for me given my limited range; I would be scrabbling around on the shallower shelf rather than being able to search out the deeper water. 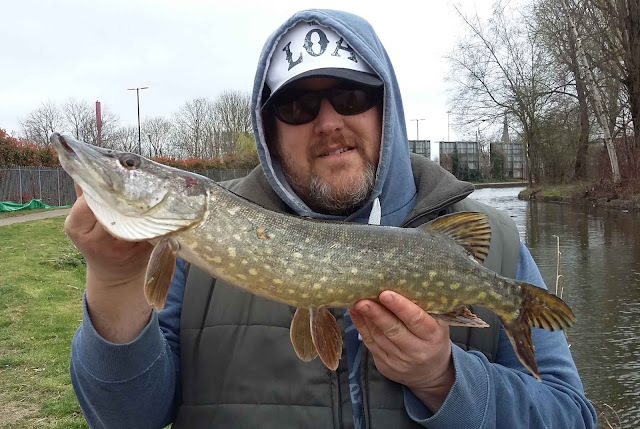 With this in mind I opted to travel out a bit to find a spot of unchallenged canal where I knew there was deeper water close in and things initially started very well when I hooked and landed a high scoring jack pike early in the match. After that things went very sour for me. I was intermittently locating single fish that I was just about persuading to bite. The problem I was having was with my hand strapped up in a brace for protection I was just that bit too slow to connect with these very subtle fast hits. I missed or lost no less than ten small fish, most of which I felt vibrating for a moment before they just disappeared. 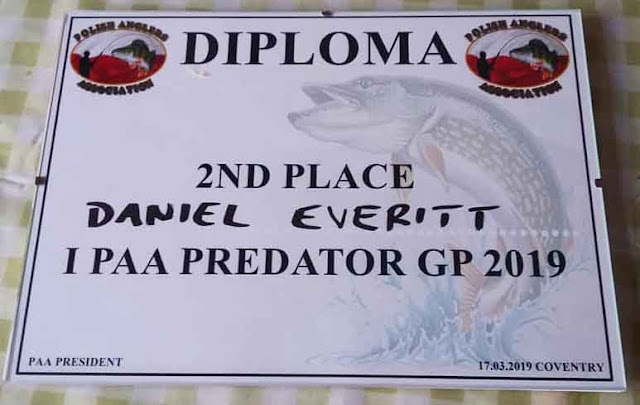 Psychologically it was very damaging as I knew that in what was going to be a tight match I lost what could have been a metre of fish. Towards the end of the match I finally found a decent perch lingering in a bank side snag which tore so hard into the lure that even I wasn't going to miss it. At 29cm it was a very welcome addition to the score card. My final hope lay in a bridge at the end of the stretch that I had been fishing. Most of the year you can pick one or two fish up around its deep structured margins and I had saved it deliberately till last just in case. My final half an hour saw me work every reachable inch of it again and again until finally I connected with a small zander which looked no bigger than 20cm when it came up to the surface and let go of the lure in one final insult. Once back at the meet point it became evident things had been hard all round and most people had struggled to return any decent scores. Though a few anglers had done very well and reports of a big pike and a few decent zander helped make the difference between the top three and everyone else when the scores were tallied up. I couldn't be to disappointed with how I'd done as things were really against me on this one with my hand not being one hundred percent. I was a little gutted that I didn't bank at least a few of those small fish to bulk up my score. Had I have been on point then I am sure I could have added close to a meter to my score which might have seen me possibly placing. It was however a nice surprise to get the prize for the largest perch and win a load of Realistic shad lures to try out before the next match. 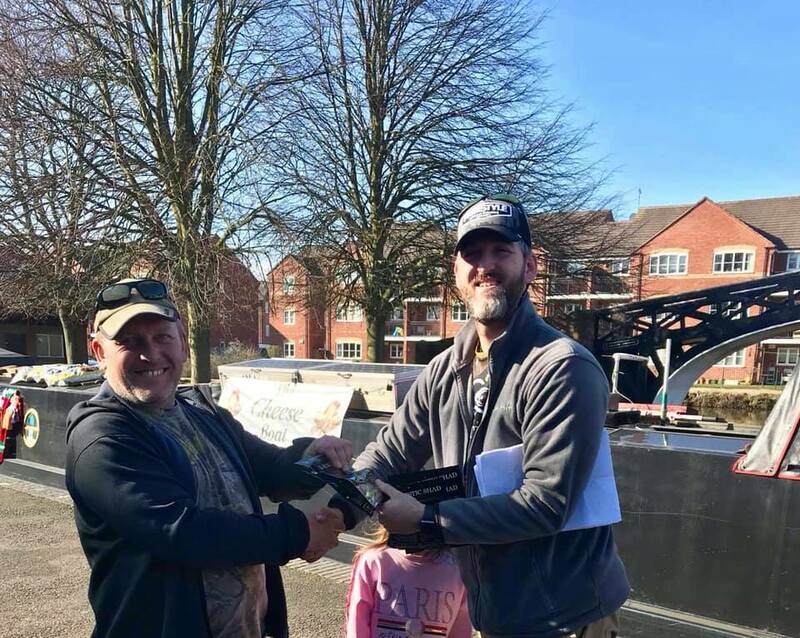 At the end of the day though I had a great time as did everyone attending which I must say is down to David Warrens hard work organising the event, and I can't wait until the next open Tusses event in a month or so time when hopefully I will be able to cast further than my rod tip. 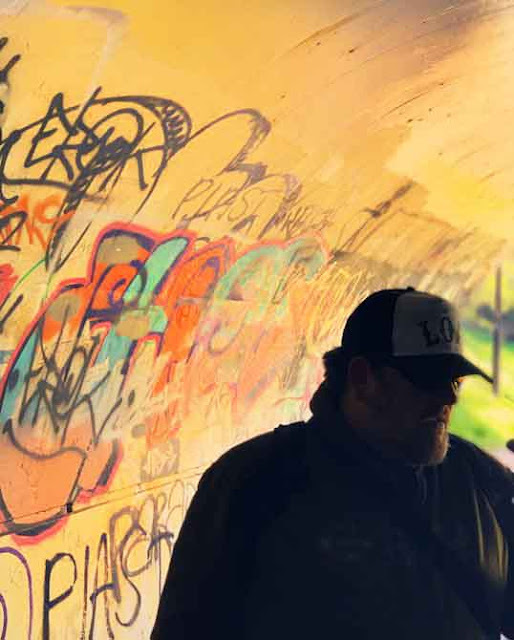 I've been gagging for a decent canal session for a while and it seems that every time I try to get out during the last few weeks things go bad and I end up having to do something else to get my fix. Well with time ticking away before I was due to have an operation on my right hand which would ultimately see me off the bank for a short while, I was left with no choice but to fish in the worst of conditions as it was the only opportunity I had. For the five days which proceeded it the skies were clear and windy, the morning I was due out it started raining heavily about 2am and did so until I thought I may never be dry again. The session although testing my endurance to be out in the wet, was a good one and in changing conditions above and below the water I coped well and made the necessary changes to keep the fish constantly coming all morning. I fished two different rigs on this practice session, using only bigger lures though. 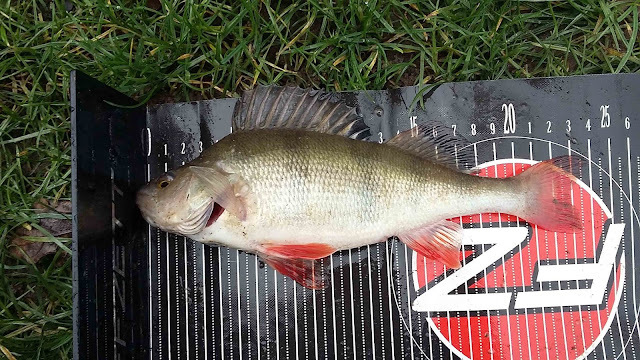 Firstly I fished the dropshot as I suspected early on that the perch would be hugging the cover in the clearer water. 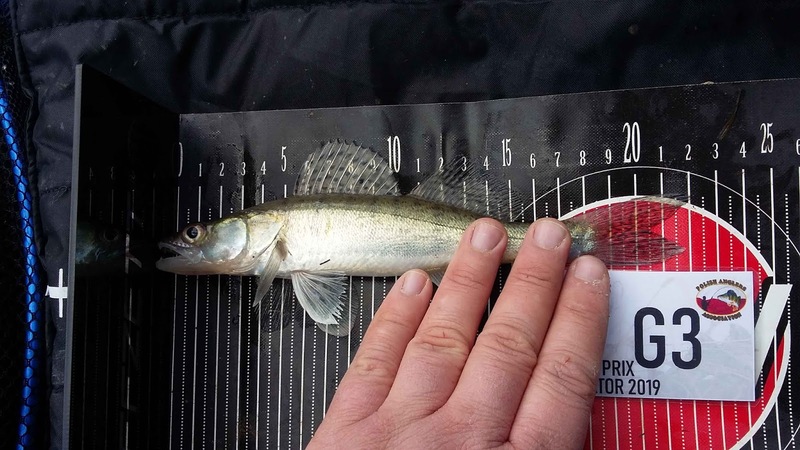 This turned out to be correct and although few in numbers the larger lures seemed to help keep the average size up. 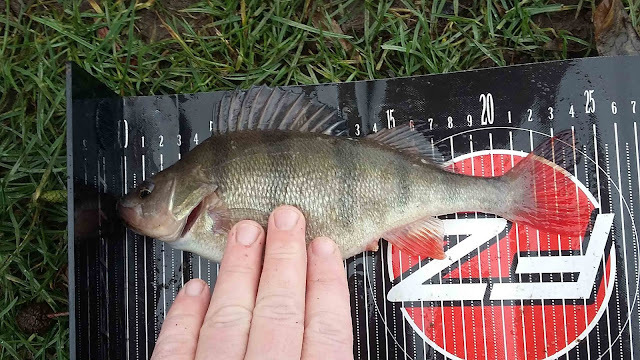 Secondly I fished a Texas rig so as to twitch a lure across the bottom; this turned out to be very successful in tempting a couple of zander and another decent perch which seemed to be lingering in the deeper channel of the canal. Changing to a bright coloured shad with a very active tail finalised this successful outing with yet another canal pike which seems to become a regular occurrence on most sessions for me this year. Who was it that was banging on about the weather being rather mild for this time of year...Oh yeah, it was me! I should have known better than to start whacking on about such things by now as fate has a way of making you look a bit foolish when you make statements like that. In the week that followed that rash sentence the weather here in old Blighty went from hints of spring to practically Arctic in an instant. One day we were thinking the daffodils would soon be out and the next the rivers froze over. It was almost like some kind of promotional stunt for the upcoming final season of Game of Thrones where they had got the actual Night King to come and touch the UK with his icy finger, and freeze it. That or Donald Tusk had turned off the heating to punish us for daring to have our own will and voting for Brexit. Whatever the cause it was cold, very cold and thus the fishing was not going to be easy. Before I'd even left the house to scrape the ice from the car I knew finding liquid water might be a slight issue. As I chipped away the hard frost I considered that every lake and canal in the county would be out of action so rivers were my only option. Not fancying the Avon I concluded to chip over to the Leam to fish some urban spots where I know the fish shoal up in winter. With only a few viable options I headed homeward thinking to check out somewhere on the way just in case it was fishable. Although free of ice when I arrived it turned out I was a bit too late to the party and a group of lads were camped out by the weir I intended to fish. So on I went to my final last chance spot way out in the country where the Upper Avon crawls silently through the potato fields. Finally my luck was in, the river was flowing and the stretch was vacant. Although there was no more than a couple of hours worth of casting in this field, that seemed a perfect amount of time considering it was currently minus five Celsius. Between the two freezing margins the river ran winter green. I knew the slower water just off the flow was a known haunt for a perch and chub so I set up a Texas rigged finesse shad from Z-man and flicked the rig tight to the far margin. It took a few casts to find a taker, but all of a sudden I felt a definite thump resonate back along the taught braided line. 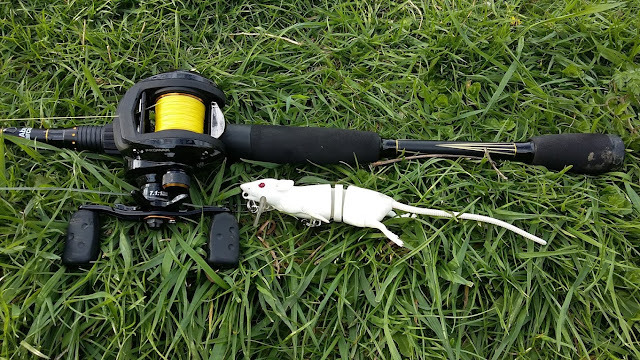 Suddenly a powerful fish was heading for the far side reed bed and all that I had to stop it was seven feet of lightweight carbon and thirty feet of six pound braid. 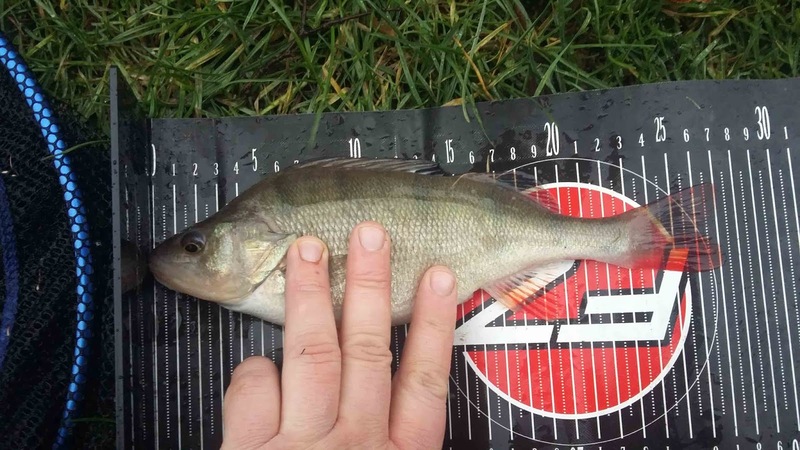 I really wanted this unseen fish to be a big chub which this area is renowned for and from the way it kept trying to do me in the bank side vegetation I had high hopes of a five pound rubber lips soon going in my net. Deep down through the winter water I could see a pale fish shape struggling against me for freedom. 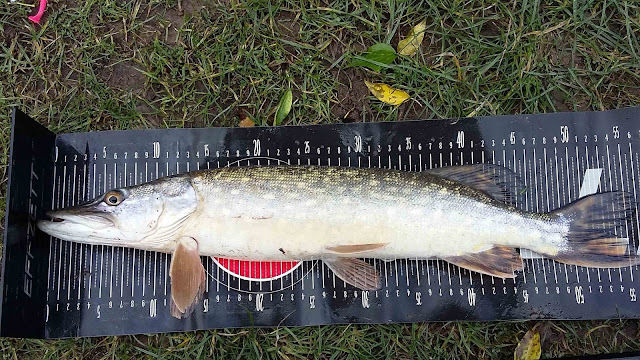 A few more dives and the fish rolled on the surface and I thought for a moment a pike was attacking my chub. One last surge of power and the fish surfaced. A pike! For a moment I was confused to whether a pike had gone for my chub and somehow the chub had got away and the pike got hooked in the process. 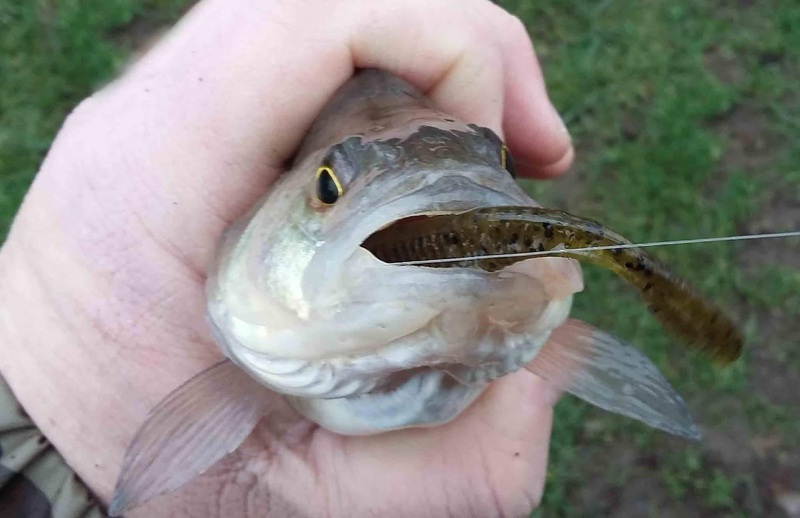 It wasn't until I looked and found the size one worm hook driven clean through the roof of the pikes mouth that it clicked that I had been playing a pike all along, no matter how much I wanted it to be a chub! Really on one of the coldest days of the year so far I couldn't have been happier with this capture even though it wasn't a chub. All the effort I made to actually find a venue on a day when most normal people left the fishing well alone, was worth it, and I continue my unbroken pike run since Xmas.